The size of an air conditioner's condensing unit is key to its cooling performance. It's actually better to have an air conditioner that is slightly undersized, rather than one that is too large for your house. A condenser that is too large will cycle on and off frequently, shortening the life of the compressor, and it will run too briefly to remove moisture from the air. You can determine the approximate size of an AC unit with a little math and some information from its data plate. Find the air conditioner's condensing unit outside the home. It is typically on the same side of the building where the heating and cooling equipment is installed inside the house. It might be mounted on top of a home with a flat roof. Look on the exterior of the condensing unit for its data plate. This is typically located at the rear, where the refrigerant lines enter the unit. Find and record the compressor's rated load amperage (RLA). Divide the RLA by 5 if it's a newer unit. The result is the number of tons the unit is. A "ton" is a unit of measurement used by the air conditioning industry. The term goes back to the production of ice. A 1-ton AC unit had enough power to make 1 ton, or mass, of ice in a 24-hour period. That is equal to 12,000 BTUs of power. Divide the RLA by 6 to 8 if the unit is an older design that uses a reciprocating compressor. The result is the approximate number of tons for the condenser. The right size of air conditioner for your home is determined by the house's age and square footage, as well as the climate. 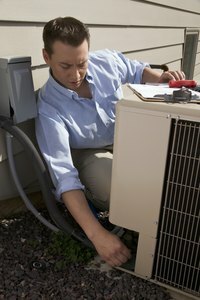 Consult a local air conditioner technician for advice on what size to install.